GRADUATION DAY: Bodycount Bedlam With Retro-Campy Charm – Schlockmania! The slasher movies of the early ’80s were the whipping boys of both mainstream critics and serious genre fans. Hindsight has allowed these movies to acquire a certain charm now that they’re free of the critical outrage. Even the movies that slasher fans consider lesser entries in this cycle can be amusing, particularly if they bring some unique quirks to the table. For an example, consider Graduation Day. It was a hit primarily because it follows the subgenre’s formula with slavish dedication: a titles sequence provides an inciting incident when a young member of a high school track team is pushed to her limit during a race and suffers an unexpected death after she crosses the finish line. A few months later, the titular event approaches and the deceased girl’s sister, Anne (Patch Mackenzie), arrives in town to collect a posthumous award for her sister – and find out why her sister died. Simultaneously, a killer wielding a lot of gym/track-themed weapons and a stopwatch starts bumping off other members of the track team. Corpses pile up until the graduation arrives, which leads to the reveal of the killer and a big showdown that brings everything full circle to the campus athletics field. Those critical of Graduation Day would argue that it did well simply because it was at the right place at the right time with the right elements. This is undeniably true. For starters, the film piles on the novelty deaths throughout its running time: highlights include a football with a fencing blade attached and a pole vaulter falling on an unexpected set of spikes. The setups for these setpieces defy plausibility but the film’s willingness to break all of reality’s rules for a garish death scene is part of its charm. Graduation Day also utilizes all the expected tricks of the time, including lots of P.O.V. camera stalking and a finale involving the last survivor running a gauntlet filled with corpses of past victims a la Friday The 13th and Happy Birthday To Me. 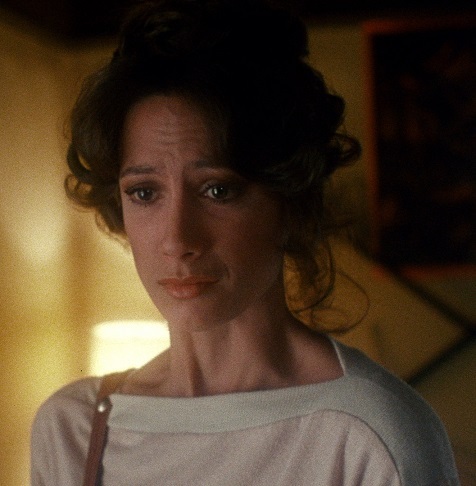 Most amusingly, Graduation Day goes out of its way to turn virtually every character it its main ensemble into a potential suspect, including Anne, the sleazy principal (Michael Pataki) and especially gruff track coach George Michaels (Christopher George). There’s enough red herrings here to fill several aquariums. 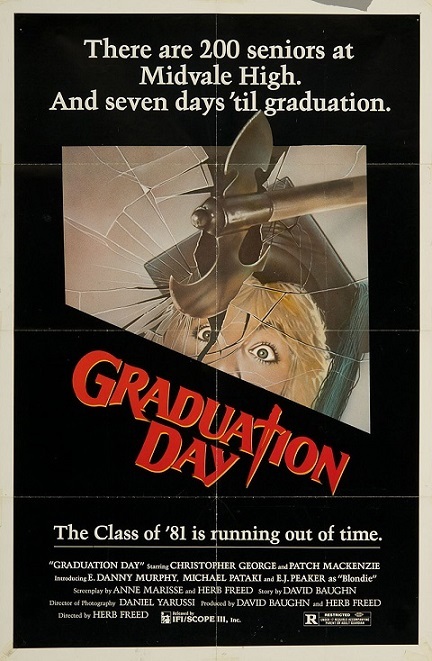 However, Graduation Day becomes interesting to modern horror/exploitation fans because it is full of bizarre flourishes that give it its own quirky personality. Director Herb Freed, who co-wrote the script with regular collaborator Anne Marisse, pushes slasher tactics so far over the top that the results have a baroque, almost self-parodic feel. This eccentric comic undertone is enhanced by the film’s surprising amount of overt comic subplots, including the principal’s secret romancing of his overworked secretary (E.J. Peaker) and a swinging music teacher (Richard Balin) who is lusted after by female students despite resembling Marvin Hamlisch in a leisure suit. There’s even a strange graduation party that has a band called Felony playing an AOR/new wave hybrid song “Gangster Rock” while kids skate and run around their podium(!). Graduation Day‘s oddball mix of shameless slasher-flick commercialism and unexpected humor is surprisingly watchable thanks to the professionalism of those involved. Daniel Yarussi’s glossy, often kinetic cinematography gives the film a slick look that belies its low budget and Martin Ja y Sadoff’s editing deploys several dazzling flash-cuts and tricky montage techniques that anticipate the MTV-derived style that would hit Hollywood filmmaking a few years later. Freed’s direction is more competent than inspired but he capitalizes on the work of his technicians nicely, creating a film that moves quickly as it constantly switches up its moods in a way that feels accidentally post-modern. He also musters up a final reel that plays like gangbusters as it mixes slasher movie tropes with “here’s why I did it” villain ranting reminiscent of a ’60s-era Psycho ripoff. Finally, Graduation Day boasts a fun cast. 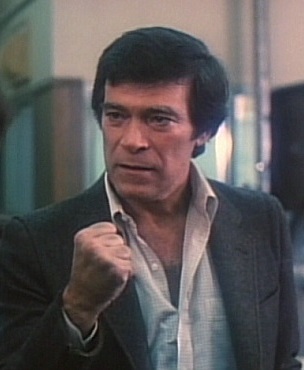 Top-billed George was right in the middle of the big “exploitation star” period that closed out his career and he seems to be having fun as he mixes snarls and sarcasm to create a perfect archetype of the blustery, verbally abusive coach. T.V. vet Mackenzie makes a solid heroine while Pataki and Peaker are surprisingly winning in their sitcom-style comedic scenes. Elsewhere, the roster of students feature a pre-Wheel Of Fortune Vanna White, a young Linnea Quigley a pre-Fame Billy Hufsey and even “Bootsie Goodhead” herself, Linda Shayne. This eclectic group keeps things interesting even when the action dips. In short, Graduation Day will never please “serious” horror fans because it represents the most shameless, potboiler end of the slasher spectrum but if you look at it as camp spectacle, it’s an enjoyably daft romp full of creative deaths, surprise stylistic flourishes and nuggets of fascinatingly goofball humor. It’s the kind of oddball indie stab at commercial horror that could have only hit theaters in the early ’80s – and as such, it’s a fun relic worth rediscovering for slasher fanatics and any other horror/exploitation buff that can appreciate its dizzy style. Hey, Don…off topic but I wanted to put in a plug for The Guest to you. Go check it out, I think you’ll like it, and I’d love to read your review of it. Thanks for the tip, Chris. I’ll keep my eye out for it. FYI, any intention of reviving the Who Does blog anytime soon? Would love to read more there. Thanks for the encouragement. Yes, I really want to go back to the site, but things have been crazy with paying work lately. Hopefully I can get back soon now that the summer superhero onslaught has abated. With respect to The Guest, a nugget you may find interesting: there was a Q&A afterward and director Adam Wingard said he divides the world into “Hitchcock people and De Palma people” and noted he is definitely on the De Palma side. There’s a lot of John Carpenter influence in this one.